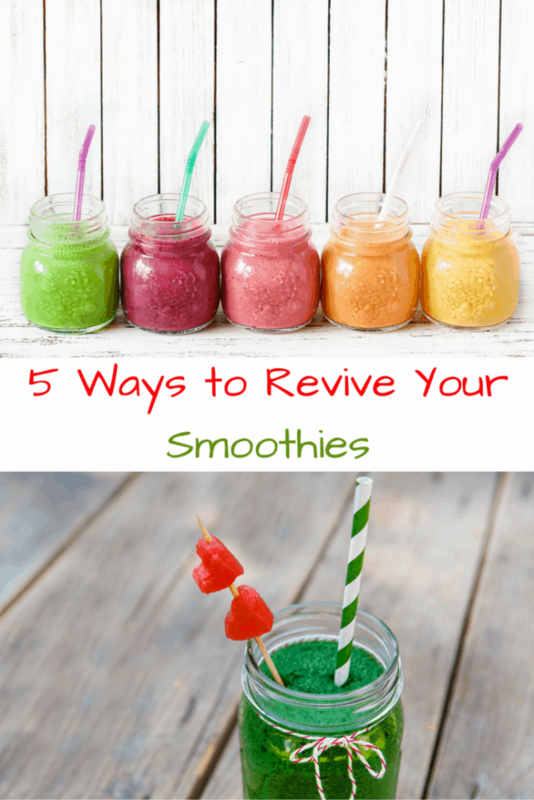 5 Ways to Revive Your Smoothies by adding simple ingredients that will change everything! My Favorite Tool for making just about ANYTHING! If you’re like me and going to regularly make smoothies, consider investing in a good machine that can blend and much more with vigor for years and years. You want a blender with serious horsepower such as the Vitamix. This powerful machine can make quick work of your smoothies, soups, creamy desserts and pesto’s and even DIY nut butters. You can create every course of your home-cooked meal-from frozen drinks to creamy desserts-in minutes. The Vitamix 5200 is the universal tool for family meals and entertaining. After going through about three $50 blenders, each lasting less than a year, I decided to take the plunge. “Buy quality and only cry once, buy cheap and cry everytime you use it.” If your interested you can check out my favorite Vitamix! There came a time when I needed to change up my morning and lunch time smoothie recipes so they wouldn’t be as boring. I was getting tired of that same ole’ strawberry-banana or apple-orange smoothie! It’s time to jazz things up a little and put a new spin on old recipes. Honey: It only takes a drizzle of this natural sweetener to jazz things up. Your taste buds will dance with delight. Honey adds sweetness without heaping on the guilt. Local honey is also known to reduce allergy symptoms for some people. Find a good honey and use just a touch for great results. Seasonal Fruits and Vegetables: What better way to add a new twist to an old recipe than by throwing in fresh seasonal produce. Depending on your region, choose local crops that are at the height of their growing season. If you have a garden or an orchard, great. If not, find a good farmers’ market and stock up on whatever the farmers are picking. Then, go home and get creative with that standard smoothie recipe of yours. Different Base: Most smoothies call for fruit juice, milk, or yogurt as the base. You can still use these but with a twist. Instead of regular milk, try almond milk or rice milk. Instead of regular yogurt, try Greek yogurt, or even cottage cheese. Instead of fruit juice, try green tea. Yes, and even coffee makes a good base for many smoothie recipes. Think ‘frappuccino’ and you have the idea. Texture: Smoothies are supposed to be smooth, after all isn’t that their name? But that gets boring after a while, too. Mix things up and add some texture to a smoothie with oats, nuts or seeds. You’ll not only enjoy the texture, but your smoothie will also be more filling and nutritious. Spices: For those of you who aren’t afraid to spice things up, try adding cayenne, cumin, jalapenos, cinnamon, nutmeg, cloves, ginger, or other spices you normally like to cook with. You’ll have to play around with the combinations and the amounts. Start small and add more as you blend. 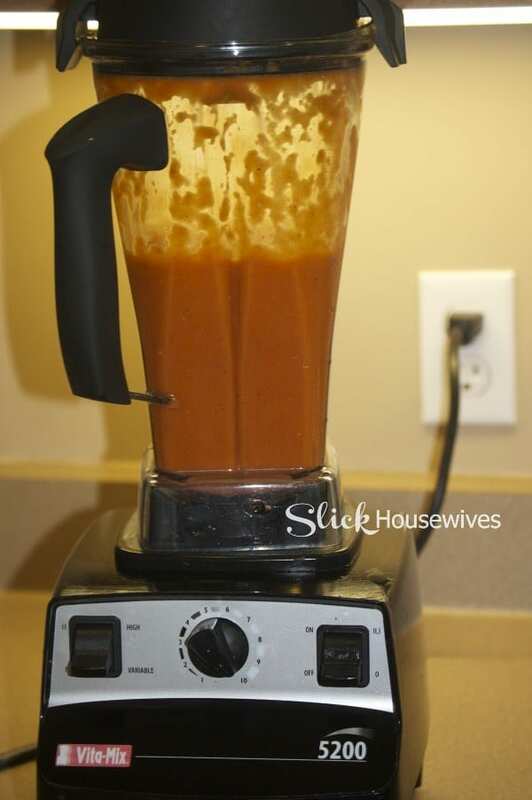 Once you get the taste-testing part done, then finish blending and enjoy your new spicy sensation. 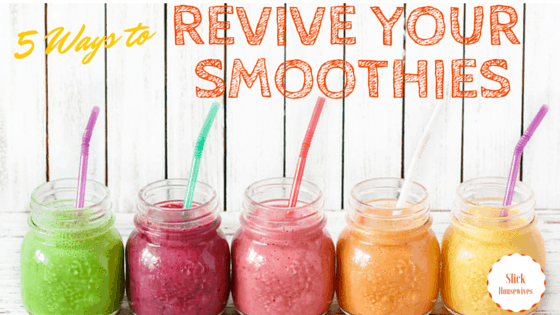 Now you have simple ways to revive your favorite smoothie recipes. The beauty of smoothies is that you can alter them in any way, so what are you waiting for? Start changing things up with different bases, texture, spices, honey, and whatever is in season. Be sure to check out a ton of recipes that you can try on our very popular Smoothie post. You can substitute or take out the protein powder that is listed in the ingredients. You can also look at a roundup of 25 Smoothie Recipes that are DEEELICIOUS! !